It is back to school season which means doing an inventory of school supplies and clothing that our kids will need to be ready to start the school year prepared. I also want to make sure my kids have a chance to show off their winning style this fall and that they feel confident in how they look when they head out the door to school. 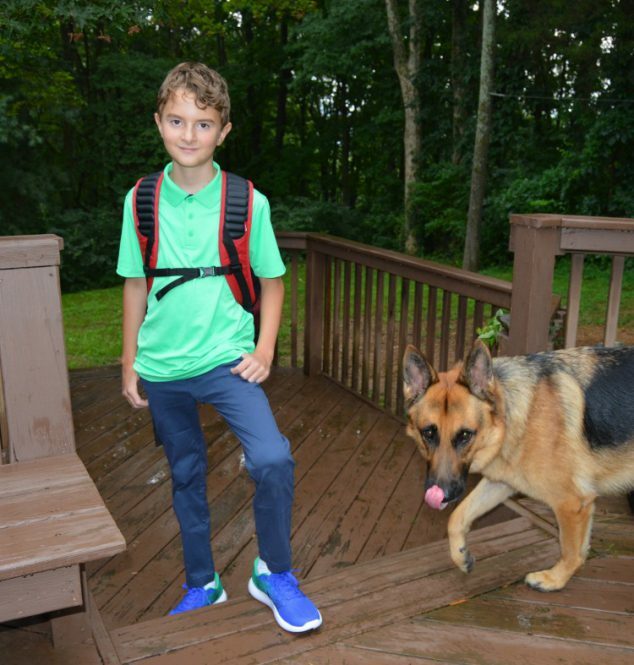 For years now, I have been shopping at Kohl’s for our back to school haul and we always find the latest back to school fashion trends and score some great deals. I am a very busy mom and I can’t always keep up with the latest fashions. However, I don’t have to because I can trust the many professional buyers at Kohl’s to do a great job bringing me the latest back to school trends. Every year, I see that they offer trendy picks such as skinny jeans, graphic tees, flowing dresses, femme overalls, as well trendy details such as destruction, new washes, patches, and shine. While we usually go for a few fun trendy items, we usually stick to the basics because we have a school dress code that is fairly strict. But when picking those basics, both as a mom and as a previous fashion clothing store manager myself, I still appreciate and notice that they are made with current cuts, fabrics, and styles that are in fashion now and that my kids will feel good about. 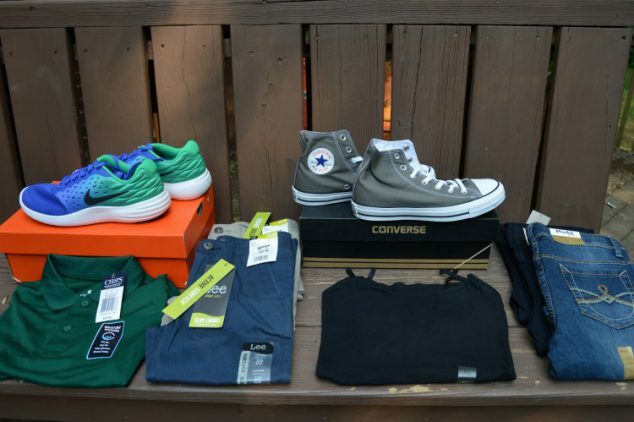 So here is our back to school haul and some of the deals we scored at Kohl’s. My daughter is all about the skinny jeans, both because they are still trendy and because she is on the slim side and they just fit her best! We found the Girls 7-16 Levi’s 710 Super Skinny Denim Leggings in black and we ordered to 2 pairs of those because it is always good to have multiple pairs of your favorite items. Levi’s never go out of style and I like the consistent quality. We also found the Girls 7-16 Mudd® Embroidered Skinny Jeans and got a pair of those because they came in slim sizes. We were able to score both styles of jeans at almost half off (take advantage of the Kohl’s Friends and Family sale so you can save too, more info below)! If your daughter is slim like mine, slim pant sizes are a life saver to keep pants from being too baggy around the waist or too short when she tries to wear smaller sizes. Tank tops are a must have layer piece for both for fashion and function They go great under her wide knit sweaters, low cut dresses, slightly sheer shirts. The Juniors’ SO® Scoopneck Satin-Trim Cami Tank Top is always a great deal and she has several already but she wanted to add a black one to her wardrobe as well. Every child needs an all purpose pair of sneakers that is comfortable and versatile enough to wear with anything. For my daughter, Converse fits that bill perfectly and she can wear them with a dress or jeans and be comfortable in the school hallways and on the playground at recess if they should happen to play a game of “infected” and she has to run. My son has an even more strict dress code but great fitting clothing is always on trend! Flat front chinos are in style for boys now and a good quality material helps them look and feel great. The Boys 8-20 Lee Sport Slim-Fit Chino Pants are perfect for my son. A sporty cut is just what my active boy needs and the slim fit is perfect for his lanky body. These pants offer trend right fits and comfort through increased stretch. We got those in two colors because you should always have multiples of your favorites. Whether your son is into the preppy style or he has to wear polos as part of his uniform, they are another great basic wardrobe item. The Boys 4-20 Chaps School Uniform Solid Performance Polo comes in several hot colors and a very nice moisture-wicking fabric. Essential for every active boy’s wardrobe is a good pair of athletic shoes for use in gym and other sports and active play he may be involved in. I found a great pair of Nike Lunarstelos Grade School Boys’ Shoes on clearance for half off! Check out all of the Latest Back To School Fashion Trends At Kohl’s and take advantage of the Kohl’s Friends and Family Sale August 17-20. Shop in store or online at Kohls.com You can get 20% off with code SAVER! like fabric to wick away moisture and enhance comfort and cool print collections, you can find it at Kohl’s! Looking for big name brands like Under Armour, Nike, Adidas, Tek Gear, Madden Girl? You’ll find those at Kohl’s too. 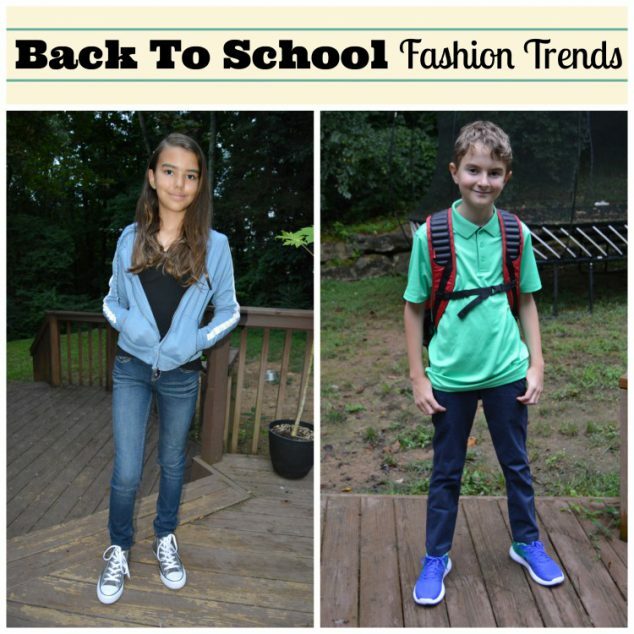 I hope you found these back to school fashions helpful and that you score some great deals. How do you help prepare your children to bring their winning game face for day 1 of school? You were able to find a great selection with some pretty amazing prices, too. Love the color of those Nike’s! A really fun, stylish back to school outfit.